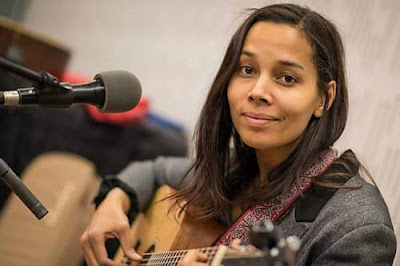 Now is the time for Rhiannon Giddens. 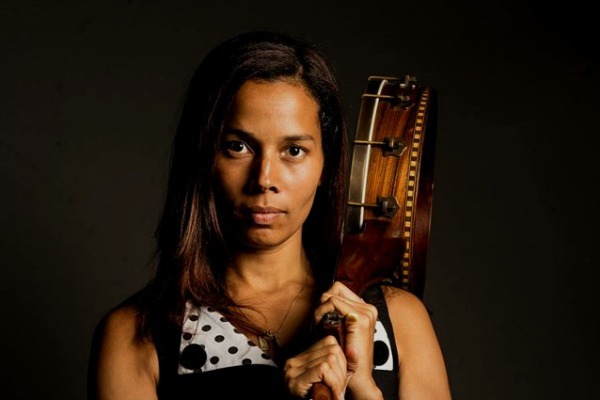 Having followed her muse beyond the homegrown string-band tableau she’d cultivated for the last decade as a founding member of the GRAMMY® award-winning Carolina Chocolate Drops, she has of late expanded her musical palette to reveal an even richer promise. 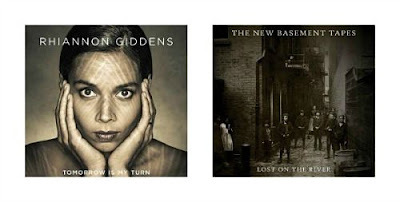 Released back in February to become one of 2015’s most celebrated works, Tomorrow is My Turn finds Giddens mostly interpreting songs popularized by such female musical forbears as Patsy Cline, Sister Rosetta Tharpe, Geeshie Wiley, and Dolly Parton. 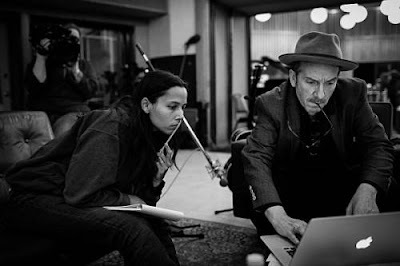 Produced by T-Bone Burnett, the album reveals an already gifted artist coming into her own while at the same time standing on the shoulders of giants. 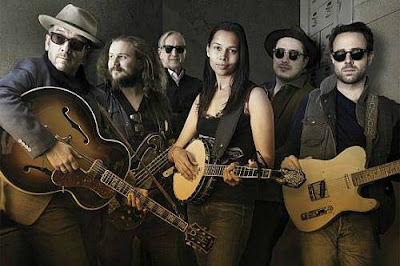 A similar scenario unfolded when Giddens was last year recruited by Burnett for the LP Lost On The River (The New Basement Tapes) — along with Taylor Goldsmith (Dawes), Marcus Mumford (Mumford & Sons), Jim James (My Morning Jacket), and Elvis Costello — to compose music for a batch of newly discovered Bob Dylan lyrics dating back to The Basement Tapes. Her lead-vocal performance of “Spanish Mary,” in particular, is among the set’s most exhilarating moments. Tomorrow is My Turn represents a new beginning for you yet you’re using this opportunity to shine a light on, particularly, female singers whose careers have preceded your own. How did that direction take shape? Was that something you wanted to pursue or did it come from Mr. Burnett? It definitely came from me. It was just sort of this idea that I’d had brewing a little bit that I wasn’t going to put it to the Chocolate Drops to record because it’s a slightly different thing. So I was kind of holding onto it until T-Bone came asking about doing a record. That’s when I kind of went, “Well, what about this idea?” He thought it was a great idea and he loved most of the song choices that I’d made. He tweaked a couple of them. But, yeah, it came from me. I’m real pleased we were able to do it. The album’s not strictly pop or soul or R&B or folk, yet it’s all of those in some way. That’s how I think, you know? The Chocolate Drops are a totally different kind of thing within a certain limitation, and this was kind of similar. I did make decisions about how far I was going to go as far as the songs I was pulling from. It’s kind of like a “feel” thing. I wanted to stick to stuff that was more rootsy and connected to the stuff that I already sort of do, for this record. I had a feel about how far I wanted to go. And there were some choices that were made in terms of the songs we left off the album that reflect that too. Like, “Well, this doesn’t quite fit. We’ve got a little narrative or a little cohesion going here and this doesn’t really fit so I’ll have to leave it off.” Throughout the whole process there was a pruning that was kind of going on. The Sister Rosetta Tharpe song [“Up Above My Head”] is really funky. Yeah, she’s amazing. Throughout this process she’s one of the ones that comes to the forefront of people that I want to try to highlight and to say, “This is not just some obscure… It’s not like Geeshie Wiley, some obscure blues woman that you should know who it is. This is a pillar of American music.” I mean, she is unbelievably important in terms of her influence and to what became rock ‘n’ roll guitar is unimpeachable. It’s like, you cannot deny her influence and yet people don’t know who she is. That’s a problem for me because it continues to reflect the narrative of American music where the black artist is the innovator and then gets forgotten about. Tharpe was innovative in rock ‘n’ roll in general, but particularly as a guitarist. Well, that’s the thing. It’s her style of guitar playing, that’s it right there. That’s what makes her so special, is that she checks so many boxes that you wouldn’t expect. It should be in the same breath. It should be “Chuck Berry and Sister Rosetta Tharpe.” You know what I mean? She should be right up there, and the fact that she’s not is a problem. Was there any anxiety in making the album — considering it’s a debut album for your solo career — that you were presenting too many dimensions, too many aspects of a first impression? Well, we definitely wanted to make sure that the final record had a cohesion to it. We didn’t want it to be too far-ranging, definitely. That took a while. And we did prune it; we left off five songs because we had quite a few recorded. It was important to make it shorter and more cohesive than longer and more complicated. We definitely felt that.... I think what we ended up with is just enough, just enough variety all within a certain aspect of Americana but not going too far. Along the same lines, was there ever a discussion about how to make some of these songs, particularly the lesser known and most dated ones, relevant or contemporary? That’s one thing we never talked about. I think if you just attempt to not copy the original, the first material, you’ll be fine with the rest of it. We’re all modern people with modern equipment. You know what I mean? That’s what matters. That’s the way I’ve always approached it. I’m always surprised when people talk about how modern this stuff is because for me it’s the interpretation of the song that makes sense. That’s what happened. That’s what came out. There was no, “Let’s make sure this sounds up to date.” If you follow your muse and you’re all kind of listening to what your muse says, that should happen because we’re all modern people with modern influences. So, it’s just trying to get out of the way, really. Having worked so intimately with the songs on Tomorrow is My Turn and also with the ones from The New Basement Tapes — even though there was no music to those when you first received them — what did you take from those experiences that may have informed or encouraged your own songwriting? All the songs that I study kind of go into this songwriting pot that I have going on in my brain because I get into the words. Part of what I love about them is how they’re written and so that whatever attracted me to that is something that I naturally gravitate toward anyway. 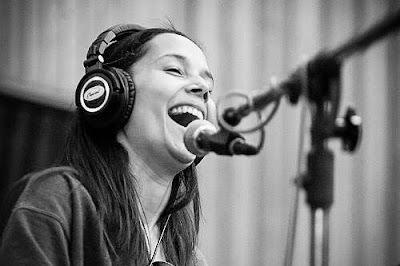 The master class that was The New Basement Tapes was incredibly helpful for me as a songwriter, as a budding songwriter. I feel like I’ve been given lots and lots of tools over the last couple years to really work on my songwriting craft. I’ve been able to work with other people. I’m definitely in a big learning phase and creating phase with songwriting.… I don’t want to just sit here and try to write fourteen songs for the next record. I’m not really interested in that. What I want to do is explore what songwriting means to me, what it is that is going to be my contribution to the music world at large other than interpretation. Because I know I’m always going to be an interpreter. That is something I do well and is something that is important not to lose sight of, but I also feel like I do have a voice to be heard. I want to make sure that there’s something really important being said. I’m not really interested in throwing songs out there for the sake of me writing songs. As an apprentice of songwriting, to be put in a room with Elvis Costello, in particular, must’ve been pretty cool and intimidating at the same time. What was great about that experience was that I didn’t know any of those guys. I didn’t know Elvis’ work, to be honest. I knew a couple of things, maybe. I just know of him. I didn’t know Jim’s work. I didn’t know Taylor’s work. I knew a bit of Marcus’ work [with Mumford & Sons]. So, really, I just kind of approached those guys as guys, and Elvis was kind of the elder statesman and a teacher. I didn’t have that stuff in the way. I had plenty of other stuff to deal with, don’t get me wrong. [Laughs] But I didn’t have that fear — “Oh, my God, that guy wrote ‘X,’ ‘Y,’ ‘Z.’” — It’s like, “Oh, this guy knows a lot about songwriting. I’m about to hear him and listen to what he has to say.” And so that actually made it great for me because I just took who they were and just learned… I learned stuff from all those guys. You exhibit such a passion for music and music history, from how it informs your work and makes it so eclectic. Where does that comes from? I’ve always been a curious person. I’m a reader. I’ve always been a reader. I’ve always liked history. Then I went to school for classical music. When you’re an opera singer, when you’re studying opera — and maybe not everybody does this; maybe it just goes back to my own personality — I studied. If I was doing an opera set in eighteenth-century France, I checked books out on eighteenth-century France and I studied it and I checked out why this character would act the way that she does. You want to learn about the composers, who’s writing the music. Then I got into Celtic music, and you’re approaching Scottish and Irish music as an outsider. I feel like it’s a responsibility to understand as much as you can ... so you’re not doing the song out of context. So I just got used to researching, I suppose. I like it and I like the power [that] I felt like it gave me over the song. Particularly when you’re doing Celtic music, people will come up to you because you’re a person of color and they can be very insensitive. They go, “Why are you singing this music?” It’s like, “I’m sorry, do you walk up to the random white guy playing blues on the corner and say, ‘Why are you singing this music?’” Hell no.... When you know more about the song than the person who’s coming up to you and asking you, it gives you power. You can go, “Yeah, let me tell you about this song. This is why I’m singing this song.” I think all of that is really important. You need to find that common ground between yourself and the song and its history and context. When you’re singing a song, you should have that common ground. You have to have common ground with it. I’ve been asked by white artists or students — because I do teach in workshops — and they go, “How do I approach this work song or this spiritual? Can I sing this?” And I say, “Of course you can sing it. Should you sing it like an eighty-five-year-old woman from Alabama? No. You shouldn’t try to sing it like that. I can’t sing it like that because I’m not an eighty-five-year-old woman from Alabama. You have to find the core within the song that speaks to your core. Otherwise, why are you doing it? Obviously there’s something that’s making you want to do the song.... You know when you’re singing something that maybe you shouldn’t be singing.... Maybe it’s the wrong time. I know for me, “Last Kind Word Blues,” I just about got in there. I wouldn’t have wanted to sing that song even a year earlier, but I just feel like I have enough whatever it is to sing that song now at thirty-seven, thirty-six when I recorded it. You know. Everybody has this sort of thing inside them that’s going, “Put this away for another time.” And I’ve done that before. But doesn’t it take a while to trust that instinct? Well, yeah, it’s something that you develop. You always develop it as an artist and as a person, really, as you get older. That’s not to say that you can’t make mistakes. I’ve made mistakes. “That wasn’t quite right.” It is a process, but the more you engage with it the quicker you can trust it.